After swimming yesterday it was time for our first trip out to an actual restaurant. We just wanted to sleep when we got in on Thursday. 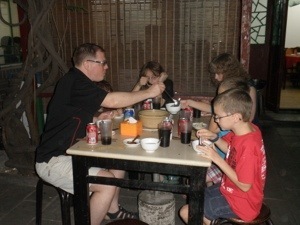 Several of the adoptive families had talked about this great dumpling restaurant that is behind our hotel The Novatel Peace. The problem was that it was hard to find more specific directions other than “behind the hotel” and it doesn’t have an english sign so we couldn’t google the name. We finally decided to just ask the concierge. He said “Dumpling shop? Yes! Follow me!” and he led us through a door the left marked Employees Only. We went through several back hallways and out a back door into the employee parking lot, which was full of bicycles and had a guard stationed. The dumpling shop was in a hutong, and the owner said we could eat outside or in one of the little rooms. We choose outside and were seated in one of the little courtyards. There was a beautiful tree growing up to shade the table. We ordered a pork rib soup which came in a huge tureen, and several different kinds of dumplings. 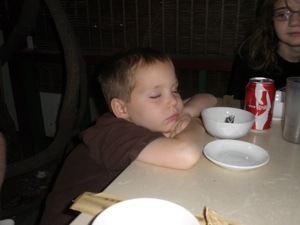 While we were waiting for the food, Vincent fell asleep at the table. 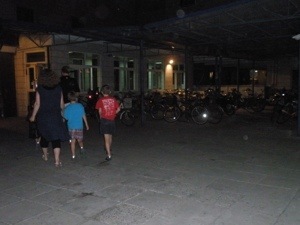 The other children watched a mother cat and kitten walking across the roof above the courtyard. We managed to wake Vincent up and eat by enticing him with Sprite. We were all completely stuffed, and the bill came to $20! Also, at the Great Wall yesterday we had our first taste of our caucasian celebrity status. 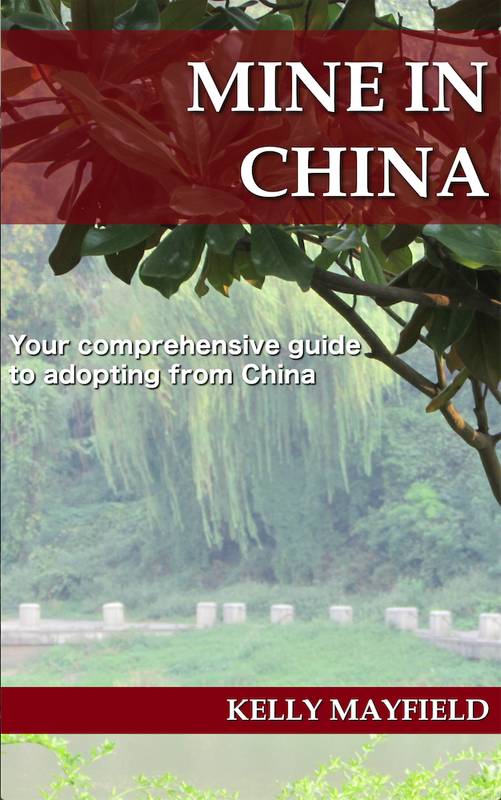 We had been warned that many Chinese have not seen caucasians before, and it is not rude to stare in China. The boys were very popular and we were stopped several times by people wanting to have their picture taken with Gregory and Vincent or Max. Even at the jade factory where their main business is tourists, we were the only people eating (I told you Nancy had a great schedule!) and the waitresses gathered around to gaze at the boys adoringly while we ate. 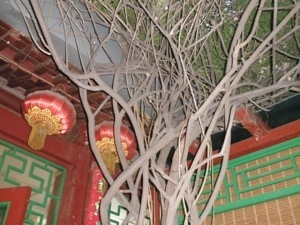 Nancy said it will be even worse today at the Forbidden City. Okay, we’re off for the day! This entry was posted in Uncategorized and tagged China trip 2013 on August 30, 2013 by minefam.